We got beef! The farmers we do our CSA with also raise cattle, and we bought 1/4 of a cow from them. You should have seen me skipping around the butcher’s building as we went to pick up our two coolers full of meat. Buying your beef locally and in bulk is a HUGE money saver. You might have to do some hunting for a ranch, farmers aren’t necessarily going to be on the internet, but trust me it’s worth it. We get ground beef, steaks, roasts, soup bones and ribs for less than $3 a pound! Because we don’t have a deep freezer (although I’d totally stuff one in our apartment if I could), we split the beef with my parents. This meant we only spent around $130 and have enough beef to last us 8 months or more. The first thing I made with our new beef was Beef Aju Sandwiches. I decided to try doing the bottom round roast in the crockpot since I knew we’d be having a very busy evening. These last two weeks have been SO hectic as last week we were trying to get our life in order (including doing all the dishes, laundry housework while each working 30-40 hours) so that we could stay at my parents and take care of my autistic brother Jason this week. I don’t know if any of you have a child with special needs, but it’s really hard to keep to a schedule or plan as you never can tell what’s going to happen. For instance, who knew that insisting he wait to take his dirty shirt downstairs to the laundry room until he’d finished getting dressed would lead to him having a two hour meltdown?! Unfortunately, this is the most difficult time I have ever had in caring for him. When things are stressful, it’s nice to have dinner practically ready when you get home, and filling the house with amazing aromas. When I walked in the door that afternoon, I breathed a deep sigh of relief and immediately relaxed as the comforting smell of roasted beef crept into my senses. I made a pretty easy salad to go with it. Because I was so crazy about the salad dressing at Springhill, I decided to make a dressing with the three citrus fruits I had on hand, a lemon, a lime and an orange. Eric LOVED the salad, which is really funny because he tells people fruit doesn’t belong in salad, but whenever I put fruit in salad he raves about how great it is. I called him on it, and he said that he just loves my salads 🙂 My posting is a little sporadic with our schedule right now, but I should be back on track by the end of the week. I miss working on this each day! Place the roast in your crockpot. Mix the dry ingredients (paprika through salt) well. 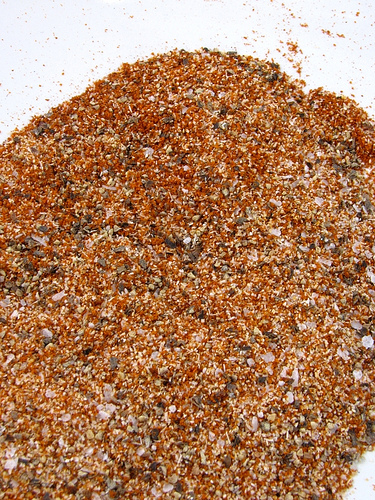 Sprinkle half on one side of the roast and rub it in, the sprinkle the rest on the other side of the roast. Rub well to cover the entire roast. Pour the water and optional beef broth into bottom of the crockpot. Cook on low for 8 hours. Slice roast thinly and place between slices of french bread. Pour liquid into small bowls for sandwich dipping. ***I didn’t use beef broth because the water in the bottom and drippings from the roast made enough liquid for two of us, then I used leftover beef for other dishes. If you want enough broth for 8 people, add the can of beef broth. Approximate cost/serving: Even if you don’t buy your meat in bulk, this is a really affordable cut. The most expensive I’ve seen it around here is $4 a pound. So a 3lb roast making 10 sandwiches is 30 cents a sandwich. Factoring in the bread and other ingredients it’s only about 50 cents a serving. Gluten Free: The meat recipe is gluten free, so serve on gluten free bread and you’re good to go. 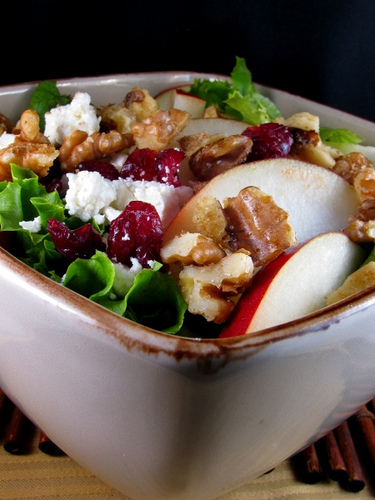 Pear, candied walnut, cranberry and feta salad with citrus dressing. 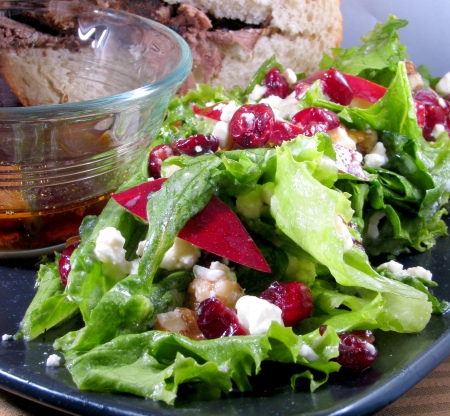 Mix the lettuce, pear, cranberries and feta in a large bowl. Combine walnuts and brown sugar in a small frying pan and toast on medium high for 4 minutes, shaking the pan every 30 seconds or so to toast them evenly. Add walnuts to the salad. 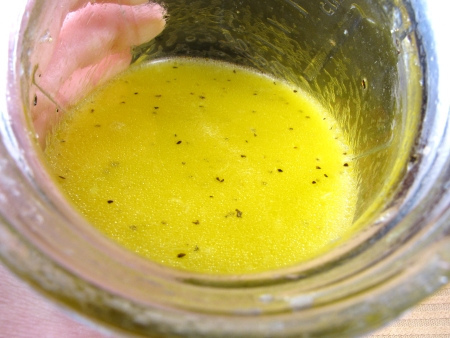 In a small bowl or jar, mix citrus juices with the olive oil, salt and pepper. Pour amount desired over the salad and toss, refrigerate remaining dressing in a glass jar for up to 6 weeks. Approximate cost/serving: Each of these fruits are so cheap! Making this dressing is way more affordable than buying a bottled dressing. It only cost70 cents for the whole cup of dressing which is enough for several salads. I use about 2 TBS a serving so you get at least 8 servings from it. With the salad it comes out to 68 cents a serving. Vegetarian/Gluten Free: Yes on both counts and vegan if you leave out the feta. Yum. A nice little combination here. Sandwich and salad. I could go for this as my lunch today. Good choice in making it in the crockpot too. Perfect for the busybodies in all of us. Our area is finally catching up to speed with CSAs for beef, pork, and chicken. –a fantastic option. 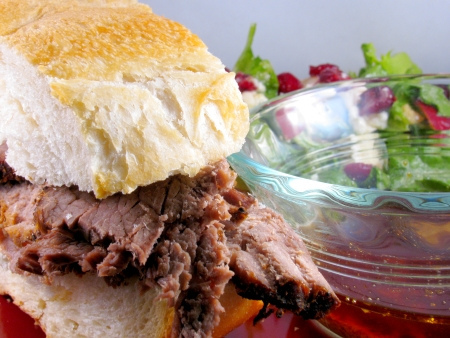 I like the cayenne and chili powder you have added to a traditional au jus…and the crockpot sure does make life easy!